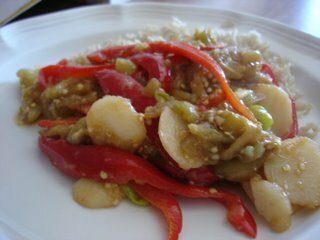 Cooking Delights: I'm getting the hang of eggplant! I made this stir fry on Tuesday afternoon. I think I am finally getting the hang of cooking eggplant. I peeled and salted the eggplant in the morning. 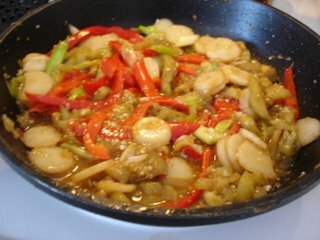 When it came time to cook the stir fry I cooked the eggplant first at a high heat until it was soft. I think it turned out really good for an eggplant stirfry.